PLEASE NOTE: I have Aquilegia's basegame default lipsticks in my game - I've used them for so long, I forgot I had them! They are SOOOO MUCH nicer than the Maxis lips. So, when you see the 'before' pictures below and they're labeled 'basegame' - it really means these basegame defaults. 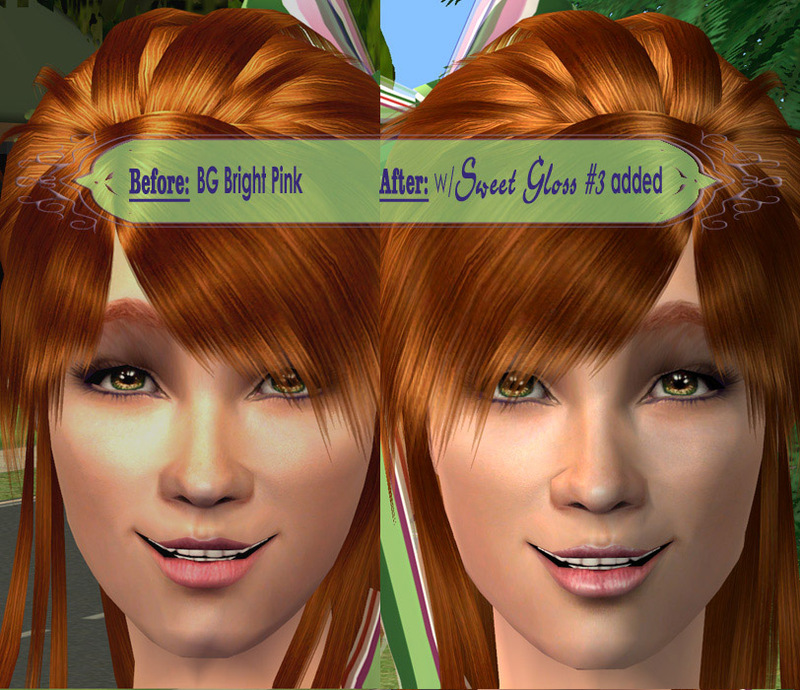 The before and after effect is shown accurately on the models. Just like my Wallpaper Overlays - these are meant to go over your current favorite lipsticks. 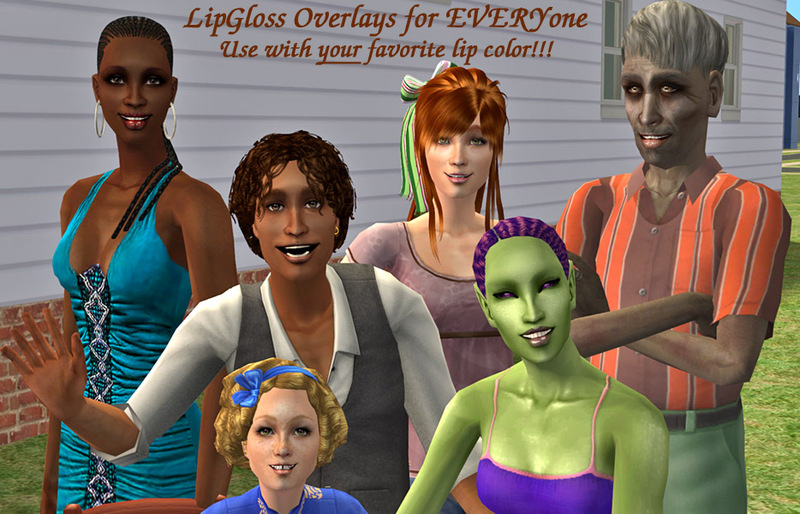 They work on ALL lips - female, male, children-to-elder, light, medium, tan, dark, alien, witch, zombie (...whatever!) matte, creamy, shiny, or bare. They also work well together - layer the glosses for an even shinier shine, or use a gloss with the Natural Overlay for definition and a bit of shine. 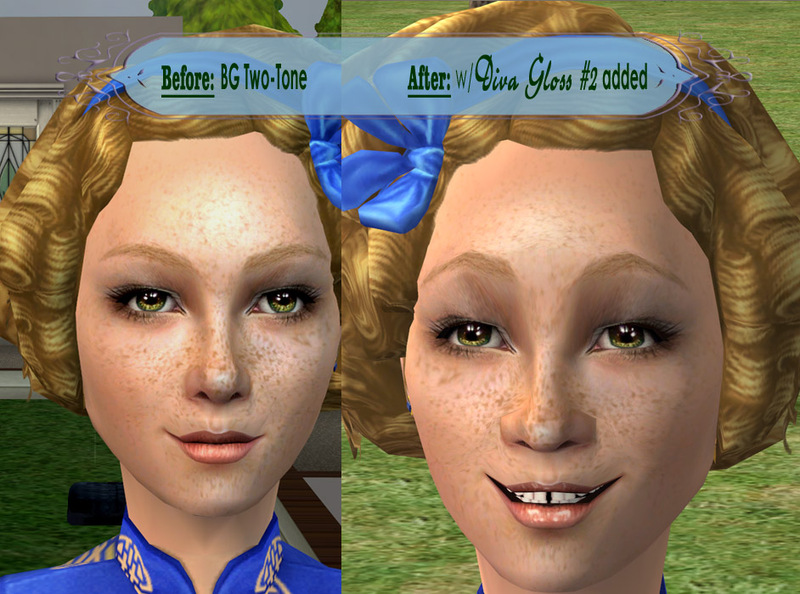 There are five different styles of Overlay: three Gloss variations, a Creamy (not quite matte) "Un-Glossifier," and a Natural Lip Overlay - which adds definition to both lips and mouth. All five styles have been carefully shaded to enhance upper lip "cleavage" and lower lip "pout" - without resorting to Botox. LOL! VVV Eileen, my fiery red-head teen, is wearing Aquilegia's basegame default bright pink matte lipstick with my Sweet Gloss #3. VVV Margaux, the exquisite dark beauty pictured below, is wearing The Lipstick that started this whole project for me: Curious B's Indus Matte Lipstick in Red - with both my Natural Lip Overlay and Diva Gloss #2. VVV Uzuri (who's lineage hails from Quadrant M17, Sector 9) demonstrates Sultry Gloss #1 over Aquilegia's basegame default matte purple/black lipstick. More 'Before & After' headshots are below. Please click on the thumbnails to view the full sized pictures - and see the difference these Overlays make! Remember, you can choose and mix your own combinations WITH your current lipsticks. Sweet! Little Lisbeth, the "ever-so-charming" - who's mother is NOT ... (She insisted on full eye make-up, professionally applied none-the-less, even though this photo-shoot was just for lips!) *sigh* Lisbeth wears my Diva Gloss #2 over Aquilegia's basegame default two-tone matte lipcolor. Wrinkles = Another IDK - anybody know??? WHEW! I think that's everything! Everything pictured is used with permission as stated in their respective TOU's - THANK YOU!!! HP for her wonderfully instructive tutorials. Alfred Askew for demonstrating the 'how' of layerable lips; and giving permission to use her textures. See her post here. 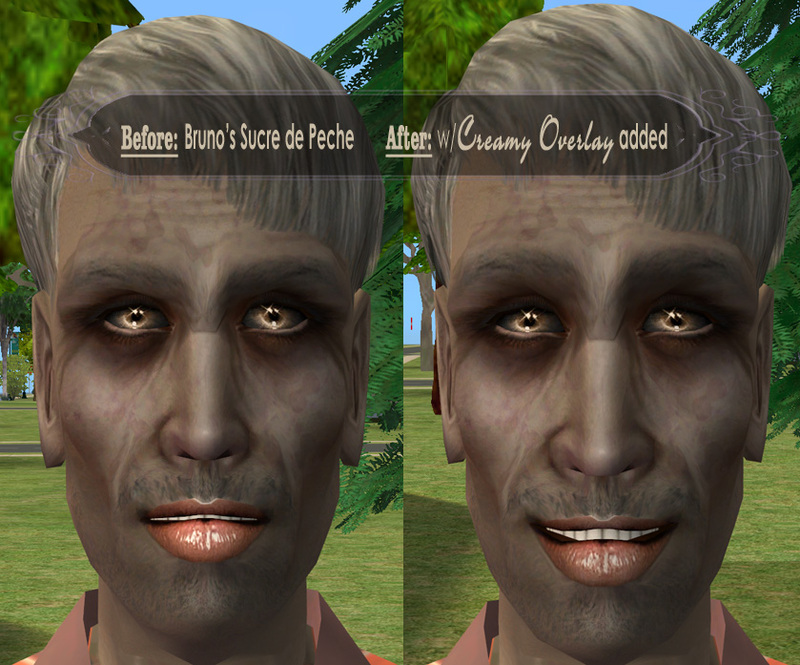 Bruno for lip shapes and gloss texture ideas that I used as a basis for my scribbles. Used with permission as per his TOU. Aquilegia for beautiful Maxis Matching basegame default lips. CuriousB for beautiful inspiring matte lipsticks! MTS2 for a pixel home.